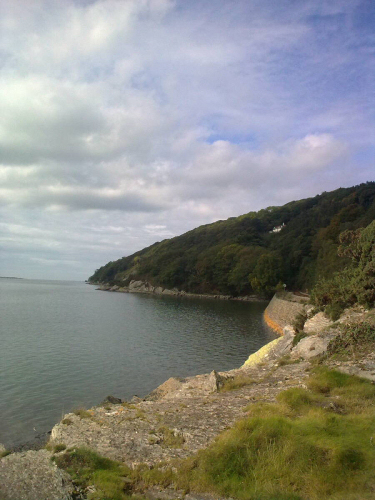 the Old Stables, Plas Panteidal, Aberdovey - Apartment 3 Sleeps 4 guests plus travel cot/s. We do not accept pets in this apartment, Wi-fi enabled. 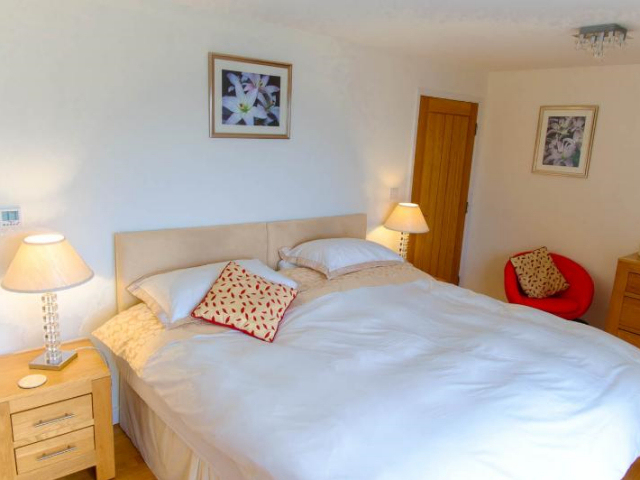 Sleeps 4 guests plus travel cot/s. We do not accept pets in this apartment, Wi-fi enabled. 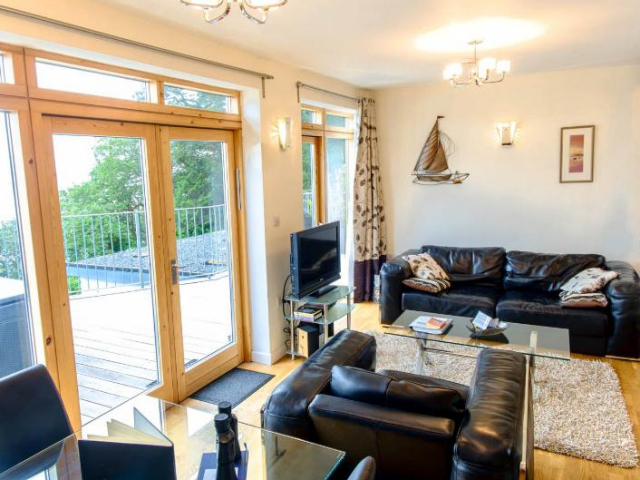 5 Star luxury treetop apatment , with outstanding views from both bedrooms and lounge, a truly wonderful apartment, spa whirlpool bath, luxury shower room, 5 star in every way. 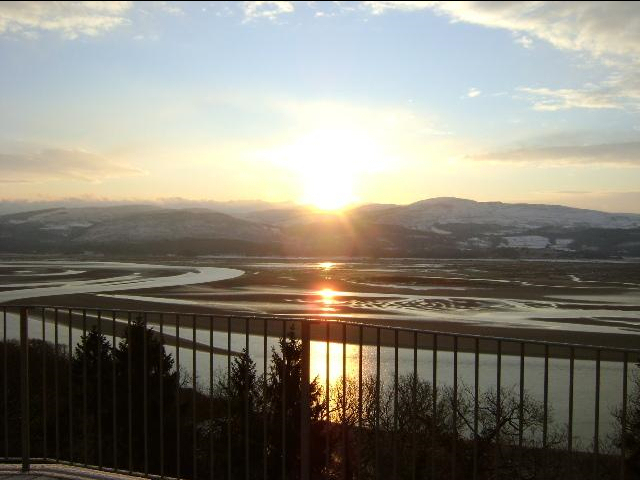 Visit www.dyfi.com dyficam to see the view today. 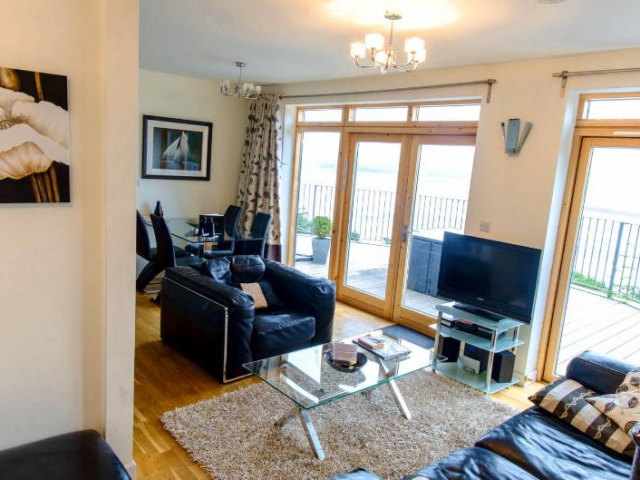 APARTMENT 3 has a lounge/dining area with fantastic views over the estuary, a luxurious black leather suite, chair and matching footstool, and and Italian design glass dining table to seat four. Doors open onto a 35 foot long hardwood terrace which has a large sun parasol, a set of all weather wicker furniture seating up to 8 people, and a gas barbeque. 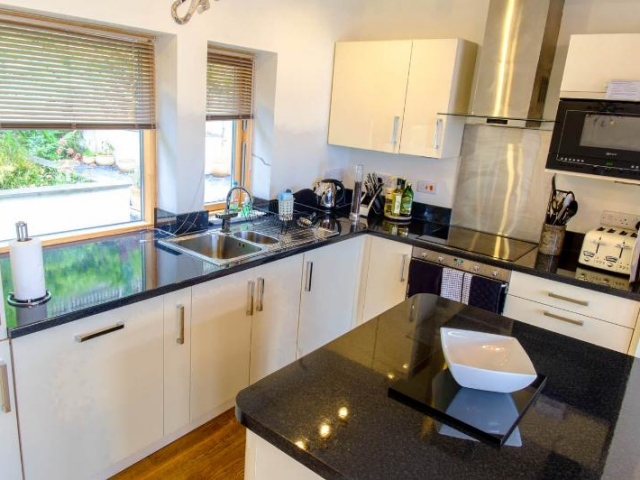 The luxury kitchen area is fitted with cream gloss units and a full range of appliances (Smeg double oven, ceramic hob, fridge, freezer, dishwasher, Neff microwave, wine chiller, fitted winerack, and a washer/dryer). Royal Doulton cutlery, Viners crockery and Viners kitchen utensils are also provided as are starter provisions such as tea, coffee, sugar, flour, wine vinegar, oil, kitchen roll, foil, and cling film. There is also an iron and an ironing board. All our water comes from our own deepwater spring which is then UV filtered to provide a sparklingly pure source for drinking and bathing. The lounge has an Italian Black leather sofa, matching chair and a footstool. There is a flat screen television with freeview, a DVD player and a separate CD system. It really is 5 star luxury. 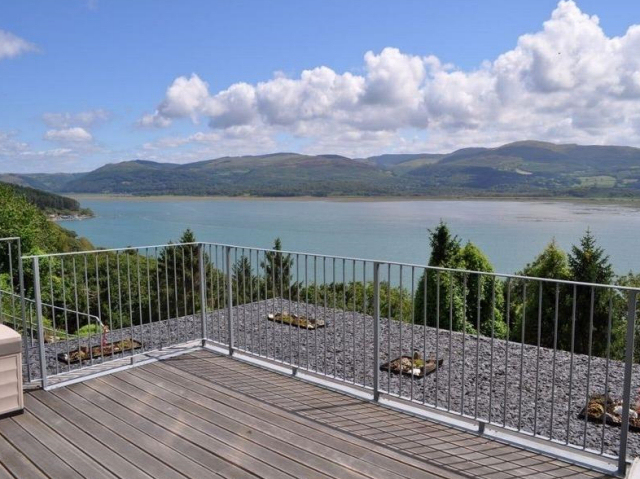 Bedroom 1 has fabulous views over the estuary with wooden doors opening onto the terrace. It is furnished with oak chests of drawers, a luxury super-king zip and link divan set, and has its own dressing room fitted with hanging rails. 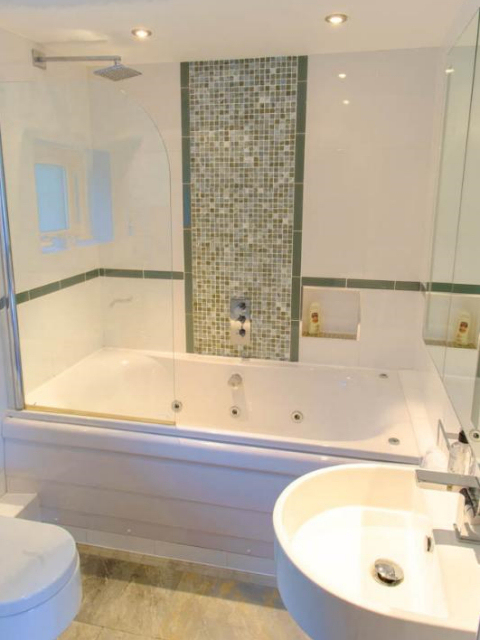 The fully tiled bathroom has a large whirlpool and air spa bath, hand basin, toilet, and mirrored cabinet. 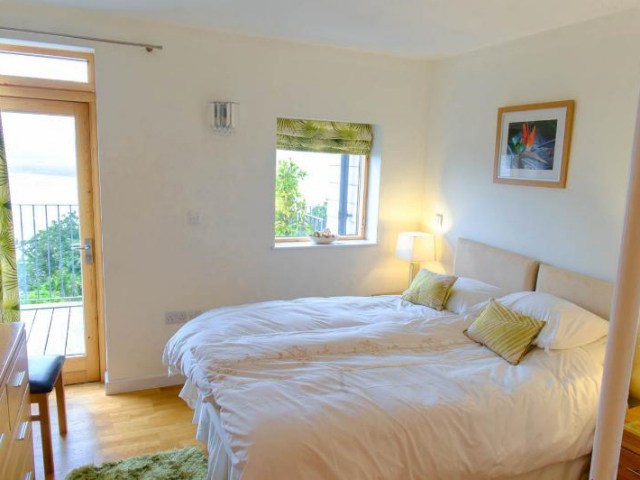 Bedroom 2 also overlooks the estuary and has its own door onto the terrace. It is furnished with a luxurious king-size zip and link divan set, an oak chest of drawers, and has a fitted mirror-fronted sliding wardrobe. The fully tiled en-suite shower room has a shower tower that gives multiple spray options, fabulous granite sparkle tiles, oak vanity unit with basin, toilet, and a mirrored cabinet. Bed linen and towels are provided for your stay. The apartment is wi-fi enabled. 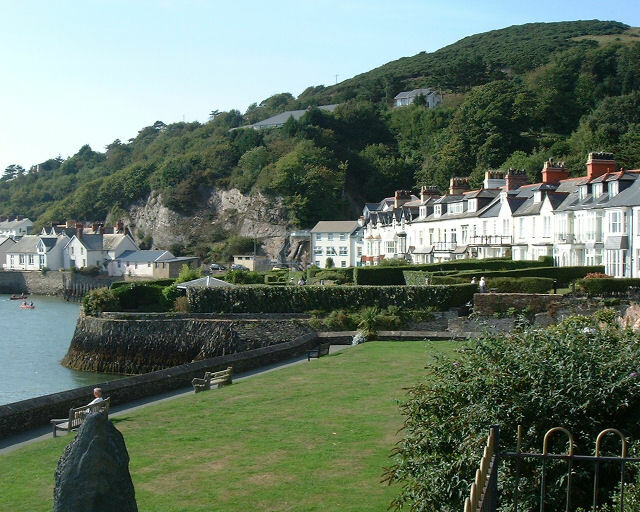 There is plenty of car parking within the grounds of the Old Stables and a remote control is provided within your apartment for opening the electric entrance gates. 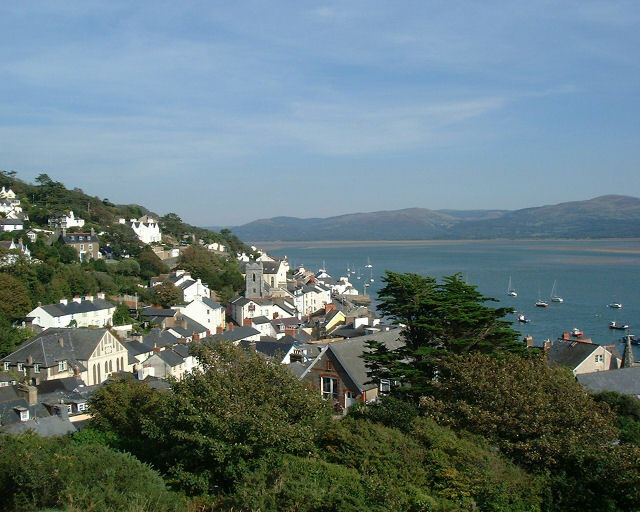 For those interested in the local wildlife and birds we can arrange guided day trips with local naturalist Bob Relph, who will collect you from your apartment and take you for a days guided birdwatching. See our enquiries page and go to the links which will take you to Bob’s website. Dyfi Osprey project. A pair of Ospreys nested on the estuary near Dyfi junction again this summer and reared three chicks. The ospreys have now all left for warmer climes but we’re hoping some, if not all, will return next Spring. The chicks have all been micro-chipped so are being constantly tracked. Follow the updates on twitter...dyfi ospreys. www.eryri-npa.co.uk This is Snowdonia National parks website, you will find maps of cycle and walking trails, plus lots of other information. www.dyfimountainbiking.org.uk will show you how great the area is. www.theholeytrail.co.uk A mountainbike shop in Machynnleth . We understand they will deliver hire bikes to The Old Stables. It’s also worth a visit to the shop for trail guides etc. 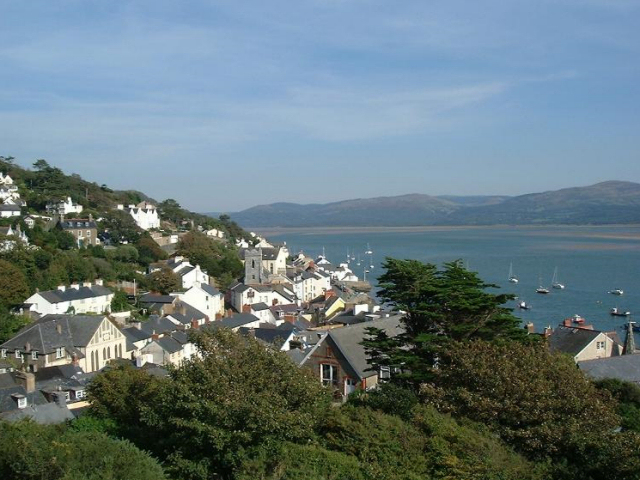 Also highly recommended is The Britannia Coaching Inn also in Aberdyfi. Plas Talgarth Health & Leisure club. 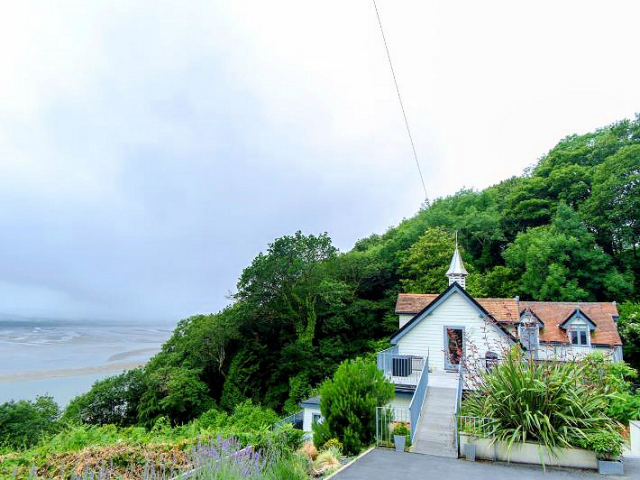 We can arrange temporary membership for your stay..The resort is just ten minutes drive away towards Pennal and has many facilities including indoor & outdoor swimming pools, gym, jacuzzi, sauna, steam room and children’s play area. Other facilities such as chip & putt, table tennis, squash courts, and snooker may be enjoyed for a small additional charge. There is also a spa for relaxing treatments and two good restaurants for you to try. A pair of Ospreys nested on the estuary near Dyfi junction again this summer and reared three chicks. The ospreys have now all left for warmer climes but we’re hoping some, if not all, will return next Spring. The chicks have all been micro-chipped so are being constantly tracked. We keep apartment 3 pet free as the apartments have become so popular we found a number of guests requiring a pet free enviroment.